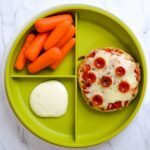 English muffin pizzas are an easy, kid friendly recipe that kids can help make. Serve them with your favorite pizza toppings and kids will gobble them up! Separate English muffins and lay on a baking sheet. Bake for 3-5 minutes or until just lightly browned. Remove from over and add half the sauce to each half of the muffin before adding the cheese and toppings. Return to the over for 5-6 minutes or until melty and bubbly. Allow to cool a minute or two and enjoy!